January 1, 2017 -- How could Trump-Pence Actually be prevented from ruling? 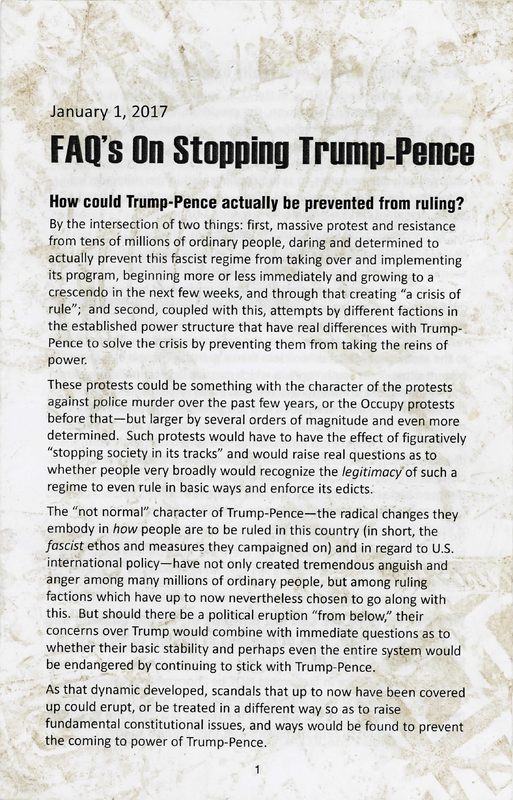 This eight-page booklet, in the form of questions and answers, is dedicated to explaining how people can protest, fight, and overthrow U.S. President Donald J. Trump and U.S. Vice President Mike Pence for their fascist politics. The booklet claims the Trump-Pence ticket is fascist because of “their attacks on immigrants, Muslims, women, Black people, the press, [and] the sciences.” Its goal is to inspire people who disagree with the President and Vice President to come together and raise their voices.